Therefore the term Thai Yoga Massage is quite appropriate, although this term is not used at all in Thailand, but only by western practitioners. However the yoga aspect of Thai Massage is not it’s only or even main aspect. Besides the yoga-like stretches, there are other elements like massaging, rocking, traction, energy line work, and kneading. Therefore labeling Thai Massage as ‘applied yoga’ is only partially correct since this is just one aspect of it. There actually is a form of Thai yoga in Thailand, but it is not widely known and hardly practiced by anyone. So Thai Massage arrived along with the yoga, but the massage flourished and the yoga, for the most part, faded or was forgotten by most Thais. It is extremely rare to find someone in Thailand who is practicing Rue Sri Datton – the Thai yoga. Although this history is the commonly accepted version of events in Thailand, it is based on legend, and obviously nobody knows for sure if this is how it actually happened. Some researchers dispute this version of the origin of Thai Massage, but it is mostly accepted in Thailand as a fact. However it doesn’t really matter if the timeline of historical events is accurate or not. The connection between yoga and Thai Massage is so obvious that it just lends itself to forming a partnership between these two systems. 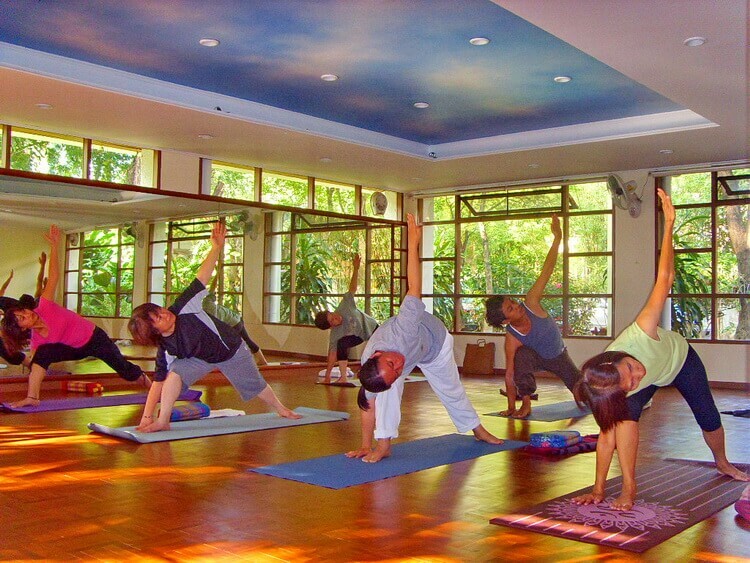 Nowadays there are quite a number of yoga schools in Thailand’s tourist areas. First, almost all of them were run by foreigners for foreign students. In recent years more Thais have been catching up with this trend, and now there are more Thais teaching yoga. They are almost exclusively female. 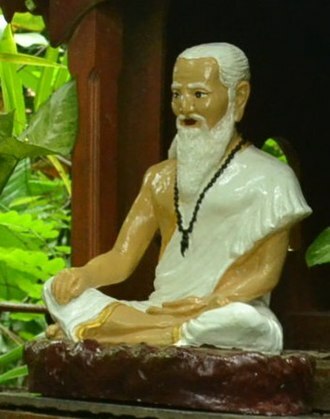 But still, the yoga styles which they are practicing and teaching are mostly based on the Indian yoga system, and not on Thailand’s own yoga style. In the larger cities the Thais are starting to take an interest in yoga – specifically the Indian version of yoga – and now there are also yoga schools run by Thais for Thai students. 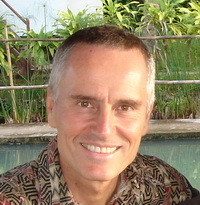 The foreigners and the Thais generally don’t mix much in the yoga classes. One reason is the language barrier. The other reason is that the Thais approach yoga, as well as life in general, in a more relaxed, easy going way, whereas westerners often take their yoga practice very seriously. 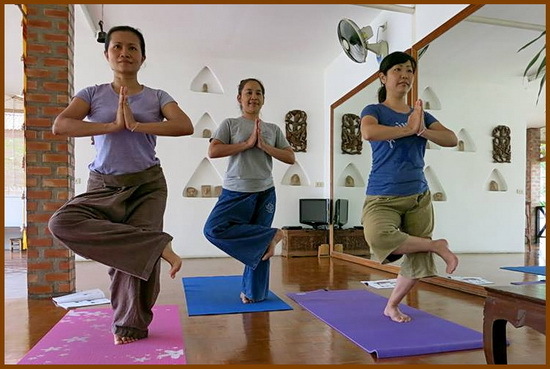 The Thais feel that western yoga classes tend to be more competitive rather than more relaxed, social events. Who popularized Thai Massage recently? For centuries massage and herbal medicine were standard and effective treatments in Thailand until modern medicine appeared on the scene and changed the perception of healing. At that time Thai Massage lost some of its popularity. It was resurrected by foreigners who were fascinated by this unique healing art. They began to write books about it, they produced Thai Massage videos, and started Thai Massage schools. On one side the growing popularity of Thai Massage resulted in a degeneration of the quality of this healing art. Most Thai Massage was either done on a tourist level or it often became a thinly disguised come-on for sexual services. However at the same time western therapists started to take it very seriously as a massage therapy. They reintroduced yoga principles, and created a huge demand by westerners for Thai Massage education and treatments in Thailand. There are countless Thai Massage schools in Thailand, and most of them are catering primarily to foreigners. The Thai government has been making a serious effort to raise the standard of Thai Massage by setting up training facilities for Thais, licensing therapists and schools, issuing official certificates, and promoting higher standards. Externally Thai Massage seems to be a sequence of stretches and pressure points, a mechanical bodywork system. But when it is combined with yoga principles and energy aspects, it becomes a true healing art. Mindfulness, awareness of one’s own body and the client’s body, working from one’s “hara”, the energetic center right behind the navel, awareness of one’s breath, conscious channeling of healing energy, and an increased sensitivity of touch all greatly increase the quality and effectiveness of the treatment. Thai Massage can be much more than a technique. The combination of yoga principles with Thai bodywork is not only an ideal combination, but it brings Thai Massage back to its roots of yoga. After all, they are part of the same family. Thai massage is excellent and it does wonders in helping the blood circulate, relieve pain, and making a person relax. It did flourish and is a very popular kind of massage. I agree with your statement that yoga and massage is part of the same family. Thanks for sharing your insights.